Adrian Archibald has finally been given the chance by Honda that could turn the nearly man of Road Racing into a proven winner on the international stage. The man from Ballamoney has had no shortage of success in Ireland but the TT and North West 200 wins he so dearly wants have eluded him. Now with full works backing Achibald looks like being capable of realising his dreams. We spoke to Adrian from his Ballamoney home about the coming season. Adrian, another successful season, but the TT win still eluded you. Do you think it is on this year? Eye, well that's what we're hoping for this year. I was happy with my lap times and that last year and breaking the lap record in the Junior but my bikes will be better this year so the TT is our main aim and I think we can do it. In the 2000 Junior TT Race you broke the lap record and nearly caught David Jefferies on the last lap, but it seemed to take you a while to get going. Did you get caught napping? No not really. I know myself that the first lap was slow, but I was trying hard. It must have been a wee bit too hard and the lap was slow. I don't really know what happened because it felt fast. I can't really put it down to anything but that. You were almost unbeatable at home on the roads in 2000. After all the trouble the sport has had to endure last season, how do you think this season will fair for you personally and the sport itself? Well at the minute there doesn't seem to be many changes taking place except for some safety improvements so everything should go ahead. Everyone still seems to be interested enough and I can't see Road Racing stopping. Almost everyone I know is carrying on and I intend to carry on as normal as well. As for my own season, I'm going ahead with much the same programme as last year. Obviously we need to get through the year with as few accidents as possible and then hopefully things will pick up, but I don't really know what will happen. What are your views on the long-term future of Pure Road Racing in Ireland? Well going by the way the MCUI have been working with the government in Ireland it looks like there could be a good future for Road Racing. As I say, if they can get through the races this year without too many accidents the sport will get a big lift and hopefully more money will come to the sport. So we're just banking on having a good season this year but you don't know what might happen. Joey Dunlop's death will obviously have a huge impact on the sport and as a teammate to Joey and coming from the same area, you must have been very close. What impact did his passing have on you? I knew Joey really well as you say, and with us both living in Ballamoney we would always be down the pub and then we go racing together at the weekends. He was a big mate of mine and it's hard, but as far as I'm concerned you have to just keep on going. We can't stop just because of that and we have got to carry on as best we can without him. You are almost taking over his position as Honda Britain's number one Road Racer. This must be a great honour for you? Oh eye, it is defiantly. Before I was sort of half backed by Honda but now I've been given this chance to be the main Road Racer for them with John McGuinness joining me for the North West and the TT. It will be nice if we are able to write a headline of 'Ballamoney Man wins TT on a Honda' during TT week? Aye (laughs). I suppose everyone's expecting me to take over from Joey as such but it will be a hard job (laughs). I'll be doing my own thing though, and what I want is what Honda wants; wins at the TT. Who do you think will be your main threat in the superbike races at this years TT? Obviously the V&M bikes will be bikes to beat and going by what you read Jim Moodie is supposedly going to ride for them but nothing is confirmed there yet. So Jim Moodie, John McGuinness on the same bike as me is right up there, Ian Lougher is always there abouts, Jason Grifthis and the guy's like Nigel Davies go well too. But you must fancy your chances in the big races with the improved machinery? Oh yes. These bikes that they are preparing at the minute should be the thing to have. And had you heard the rumour that David Jefferies hasn't put pen to paper with Ducati yet for the Short Circuits? Well this is it. It's hard to know who will be riding what at the minute. Nobody has anything finalised but David Jefferies will be another guy to worry about if he's there for sure (laughs). Last season you were the best performer on the roads riding a Honda Fireblade, which you will be riding once again this year. Some riders have said that the machine is not competitive with the Yamaha R1, but what do you think? Well Moodie and Duffus were riding the Blades obviously and the ones they had were a fair bit better than the on I was riding. They had a lot more special parts than I had but in the end of the day I actually ended up beating them at most of the races so I did. The bike I will have this year will have all the top chassis parts, which I didn't have last year. I mean at the TT last year I couldn't even change tyres at the pit stop's because of this, which meant doing six laps on a tyre, which wasn't great. Then the engines will be developing a lot more power than the ones that we had last year. Honda did leave it too late last year, and the package wasn't sorted but they have put in a big effort and I believe the bike will be good enough. So you think it will be as quick as the V&M R1's? Yeah that's what we're hoping for and Honda have been working on it since the TT last year so they should be sorted properly for this year. The TT as an event is also under close scrutiny at the moment and has been accused of having a poor entry. 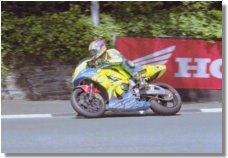 What are your views on the future of the TT? I think it has a good future because I mean you have all your English Short Circuit guys who might not ride any other roads but the TT. Obviously they wouldn't come over and the Road Races in Ireland so to me it looks promising when these people are still coming over to race. I think as long as you get these top riders there the TT will go on, but if they stop coming, you may start to see it go down hill a wee bit then. Are there any changes you would like to see made by the organisers at the TT? Well some of the races over here might be not so well organised and whenever I go to the TT, everything runs like clockwork. As far as I'm concerned, the TT is the best run event I would be at along with the North West by a long way. And things like start money I'm happy with. They have been giving me more money each year as I've been going better, so I'm happy enough. It would be different if you were doing better every year and they weren't giving you more. Then there is the prize money, which is really good you know. The only complaint I would ever have is with last years Production Race. I don't think that should ever have been run because it was really dangerous that day. Finally what are your long-term ambitions? Well I want to keep on winning the Irish Championships. I lost out on the Regal last time and I would like to get that back. At the start of last year I said I would like to have top three finishes at the TT, North West and Ulster Grand Prix and I managed that so this year I'll be looking to win at least one race at each of those events. Best of luck for the season and thanks for speaking to us. No problem. I'll have a couple of announcements to make week so I'll keep you informed but I can't say anything just yet. Cheers. By the way, there is a rumour doing the rounds that you might be riding a 400 at the TT. Is this true? Ah well there you have it. Ok, thanks again Adrian. Nay problem Paul see you later.